THE HISTORY OF BLUE | Through solidifying my wardrobe staples his past year, I've grown to rely on blue on as one of my reliable go-to neutrals. From faded pastels, to rich denim and every shade in between, it has such a transcending quality which flows between seasons and temperatures equally well. From an artistic perspective, blue was coveted by classical painters as well as modern artists like Yves Klein and Mattise for whom it became a signature hue. This short video about blue is pretty neat. RHUBARB ICE CREAM SANDWICH | There's something wonderfully playful and delightful about ice cream sandwiches and this creative twist on the classic really caught my eye. Now in all honesty, I've never actually tasted rhubarb myself and before reading this post by the lovely duo that is Luis and Elsa, all I had in mind were pie and the odd green juice. Not only does it look super simple but the rhubarb adds a wonderful colour that's deceivingly raspberry-esque. I've also been having a wonderful time discovering a few new-to-me food blogs and The Green Stories lured me in with their authentic writing style and drool worthy photographs. Worth bookmarking. CUSTOM FACE POWDER IN 1958 | Whilst bumbling around and watching vintage fashion clips, I happened upon this short clip demonstrating how makeup was customized in the 1950. When we think about the personalization of beauty products that's recently become the rage again in the last few years, it's worth recognizing that specialized products have long existed. All vintage undertones aside, I love watching the beautician nonchalantly scoop up the pastel coloured powders housed in pretty little candy jars. I wished they still did this by hand today! 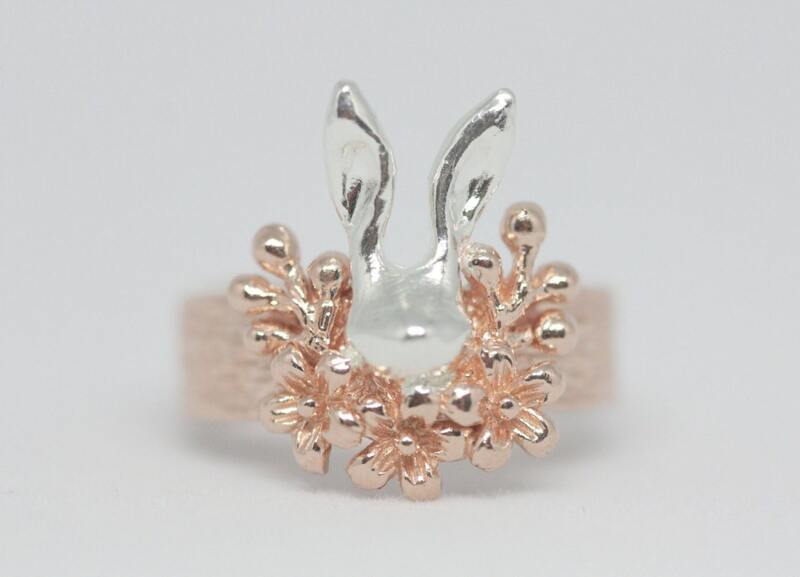 It's no secret that I have a thing for rabbits and this limited edition ring from Korean jewelers Ted & Mag on Etsy is darling! I'm usually not a fan of motif designs and I don't even wear jewelry all that frequently but their whimsical designs are so happy to look at and I'm sure even more smile inducing to wear. If you're not a long eared kinda person, they also feature other woodland animals like deer and birds. NUTRI NINJA BLENDER | Let's get one thing straight here. I really do like cooking and I look forward to dreaming about my weekend brunch and all the possibilities. But possibilities also needs some multi-functional tools to be realized and blame it fully on the infomercials and QVC's Youtube channel because I am now fully convinced that I need one of these Nutri Ninja kitchen heroes. I'm imaging that it'll be perfect for single or double servings and leaves more time for enjoying rather than prepping and cleaning. Thoughts?